For the 1758 British expedition, see Capture of Senegal. The French conquest of Senegal started from 1659 with the establishment of Saint-Louis, Senegal, followed by the French capture of the island of Gorée from the Dutch in 1677, but would only become a full-scale campaign in the 19th century. According to some historians, French merchants from the Normandy cities of Dieppe and Rouen traded with the Gambia and Senegal coasts, and with the Ivory Coast and the Gold Coast, between 1364 and 1413. Probably, as a result, an ivory-carving industry developed in Dieppe after 1364. These travels, however, were soon forgotten with the advent of the Hundred Years War in France. Various European powers, such as Portugal, the Netherlands, and England then competed for trade in the area of Senegal from the 15th century onward. The Portuguese first established a post on the island of Gorée in 1444, from where they organized a slave trade. The island was captured by the Dutch in 1588, where they established defensive forts and developed trade further. In 1659, France established the trading post of Saint-Louis, Senegal. The European powers continued contending for the island of Gorée, until in 1677, France led by Jean II d'Estrées during the Franco-Dutch War (1672–1678) ended up in possession of the island, which it would keep for the next 300 years. In 1758 the French settlement was captured by a British expedition as part of the Seven Years' War, but was later returned to France in 1783, following French victory in the American Revolutionary War. The states of the Wolof and Sereer, neighbouring the two colonial outposts, were particularly involved with the slave trade, having strong military organizations geared to supplying slaves to the Europeans. Conflicts erupted with the Muslims to the north, as when Marabout Nasr al Din attacked Mauritania and the Wolof across the border in 1673, but he was defeated through an alliance between local forces and the French. During the Napoleonic Wars, Great Britain captured Gorée in 1803 and Saint-Louis in 1809, and proclaimed the abolition of the slave trade in 1807, to which the new French monarchy had to agree upon recovering the two posts. The 19th century thus saw a decline in the slave trade, and the rise of commodity production instead. The trade of acacia gum, used for dyes for high-quality textiles and for medicine production, became paramount. Peanut cultivation also proved to be a valuable resource for the area. In the Franco-Trarzan War of 1825, the French started to assert control of the mouth of the Senegal river against the rival state of Trarza. In the 1850s, the French under the governor Louis Faidherbe, began to expand their foothold onto the Senegalese mainland, at the expense of the native kingdoms. From 1854, Faidherbe started to establish a series of inland forts up the Senegal River. In 1855 he conquered the Kingdom of Waalo. A counter-attack by the Toucouleur in 1857 led to the Siege of Medina Fort in which the Toucouleur failed. By 1860, the forts built between Médine and St. Louis allowed Faidherbe to launch missions against the Trarza Moors in Waalo (north of the Senegal river), who had previously collected taxes on goods coming to Saint-Louis from the interior. Faidherbe also started the westernization of the area by developing banks, civil administration, and also established an accord with Senegal’s religion, Islam. In 1902, Dakar became the capital of French West Africa. Expansion continued under Governor Louis Brière de l'Isle from 1876 to 1881. Through diplomatic and military efforts, Briere reinforced French control on the Senegal river, the "Peanut Basin" and the Guinea Coast in favour of the development of millet, peanut and cotton trade. He also developed railroad projects that would facilitate further expansion as far as French Sudan (modern Mali). From 1880, France endeavoured to build a railway system, centered around the Saint-Louis–Dakar line that involved taking military control of the surrounding areas, leading to the military occupation of mainland Senegal. The construction of the Dakar-Niger Railway also began at the end of the 19th century under the direction of the French officer Gallieni. However, there was much opposition of the railroads being built from the natives. This was especially true with Muslim leader Lat Jor and his following. The first Governor General of Senegal was named in 1895, overseeing most of the territorial conquests of Western Africa, and in 1904, the territories were formally named French West Africa (AOF: "Afrique Occidentale Française"), of which Senegal was a part and Dakar its capital. ^ Klein, M. (2007). France's African Colonies. In T. Benjamin (Ed.) Encyclopedia of Western Colonialism since 1450, (Vol. 2). (pp. 490) Detroit: Macmillan Reference USA. ^ Klein, M. (2007). France's African Colonies. In T. Benjamin (Ed. )Encyclopedia of Western Colonialism since 1450, (Vol. 2). (pp. 493) Detroit: Macmillan Reference USA. ^ Klein, Martin A. (1998-07-28). 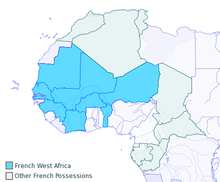 Slavery and Colonial Rule in French West Africa. Cambridge University Press. p. 59. ISBN 9780521596787. ^ Connolly, Sean (2015-11-05). Senegal. Bradt Travel Guides. p. 1. ISBN 9781841629131. Kanya-Forstner, A.S. (1969). The Conquest of the Western Sudan: A Study in French Military Imperialism. Cambridge: Cambridge University Press. ISBN 978-0-521-10372-5. .
Saint-Martin, Yves-Jean (1989). Le Sénégal sous le second Empire: Naissance d'un empire colonial (1850-1871) (in French). Paris: Karthala. ISBN 2-86537-201-4. Webb, L.A. (1985). "The trade in gum arabic: prelude to French conquest in Senegal". Journal of African History. 26 (2–3): 149–168. doi:10.1017/s0021853700036914. JSTOR 181721. This page was last edited on 19 April 2019, at 02:17 (UTC).